Usually I make some sort of Photoshopped “adventure” for the makings of these things (see the infamous SNESp or NOAC NESp stories) but with the PS2p I decided to go for a more step-by-step telling of the actual construction process. I often get questioned as to how I build these things, so I thought I’d make this as informative as possible. 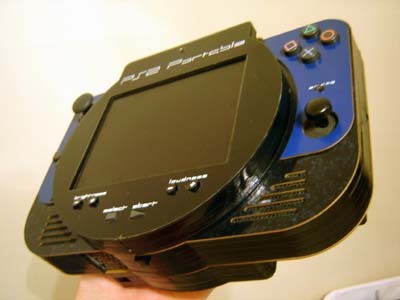 I first starting making a PS2 portable at the beginning of 2004 using a regular PS2. 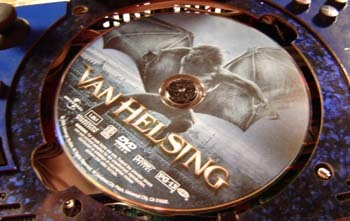 It was going OK and I even had a Ni-MH battery that would run it but I was having problems with the DVD drive. I kept at it all spring, then I had to work on my book. With the book done (in October) I could get back to doing a PS2 portable. My goal was to have it done before the real PSP was released. 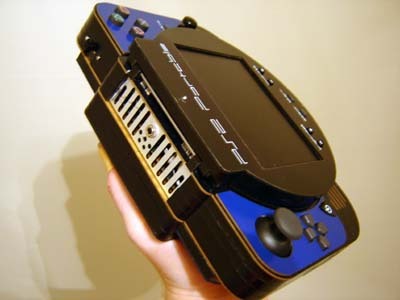 (For fun and shock value) Also in October the new smaller PS2’s were coming out. I discovered they had an external AC/DC adapter and ran off 8.5 volts. This seemed reasonable to me so I bought one – the fine folks at the Game Store Formerly Known As Funcoland got them in a few weeks early much to my delight. This gave me a head start over other portabilizers! The next step was finding a power source that would work and hopefully provide at least a couple hours of play time. 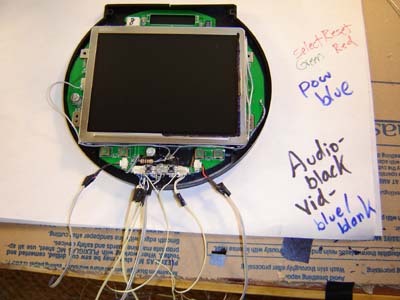 The battery is usually the second trickiest factor in making one of these (the unit itself being the first) because you can’t really “hack” a battery – it’s gonna be the size it is and you have to deal with it. I kept my receipt in case it didn’t work so I could return it. (Pretty crafty of me, I know. Don’t tell the big “WM”). 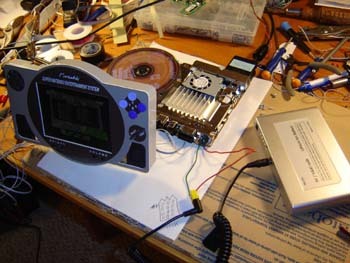 I then hooked a 5″ PSone screen to the small PS2 and powered them both off the battery, as shown below. It consumes about 1.9 amps on average. This was all done in 2D wireframe as vector objects. Some may be wondering why I didn’t use a 3D program… the answer is I’m used to doing it in 2D, I don’t have a 3D program and the CNC cutting machine I intended to use takes 2D graphics to run. Sure it requires a little more thought and extra “side view” drawings to establish proper depth but my brain needs a workout every so often anyway. The design of the unit took about a week (Interspaced with me playing GTA: San Andreas) All the original designs I did in the spring were thrown out as this unit was going to be smaller and thinner anyway. This unit looks similar to the original design but it smaller so I just started from scratch. Some see an empty computer screen as intimidating but I see it as an opportunity to do things better than last time! Next up I had to tear apart the battery pack (which was HARD, that thing was sealed tighter than the JFK files) and install it in the back of the unit as shown below. The shoulder buttons were also part of this assembly. The more things you can combine together the easier it is to assemble. 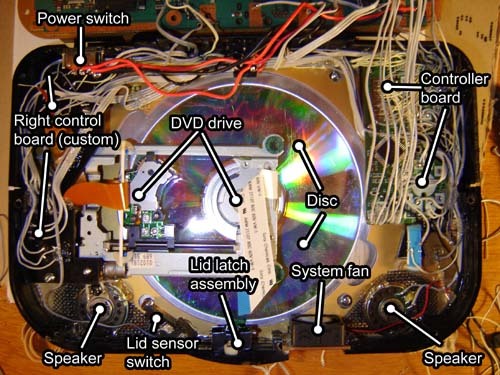 Here’s the DVD drive for the PS2. 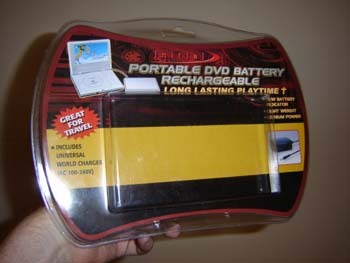 It’s quite small and compact (and redundant) which was a relief to me – the original PS2 drive was somewhat cumbersome. (The word “Cumbersome” always makes me think of cucumbers…) It mounts to the same piece of plastic the right analog stick does. What happens is I try to find as many parts of the same depth and mount them together. 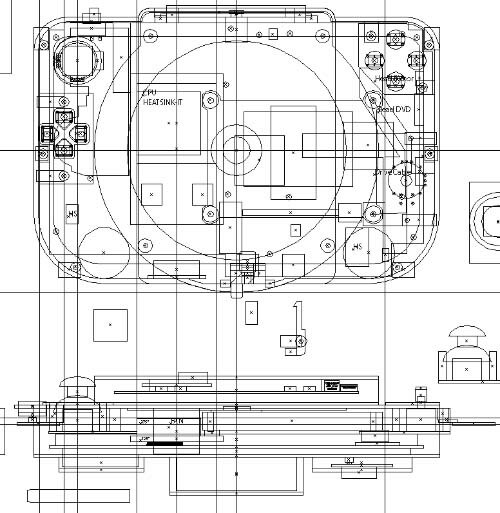 Both the analog stick and the drive mounts had to be .5″ from the front of the case so here they’re combined. I also made a custom analog “knob” for the right-hand stick so it wouldn’t bump into anything. It has less room to move than the main left stick. The DVD access cable (lower right gold thing on photo) can still reach the original jack which is handy because it’d be hard as heck to rewire. The other 2 cables from the drive have to be rewired but they weren’t too difficult… only slightly painful to the rear. 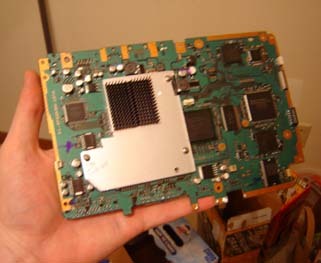 This is the PS2 board with the new heatsink on the CPU. I had a piece of 1/8″ aluminum cut, which sticks to the chip with thermal tape and also has an off-the-shelf heatsink on top of that. Since there was some mushy foam stuff on top of the chip I needed to use screws going through the motherboard to pull the heatsink against the chip, rather than just have it sit atop it. This allows for better heat… flowage and also makes the heat sink become part of the motherboard for a nice, compact unit. 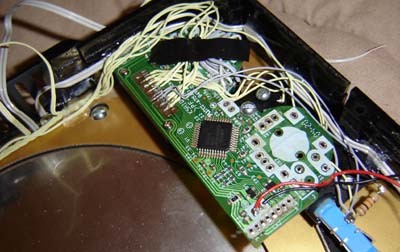 Here’s a hacked-up PSone screen with a bunch of rewiring, laying in one half of the screen case. I’m gonna use the RGB signals off the PS2 for this project. That way the 5″ display will be really sharp! Note how I’ve carefully color-coded the wires so I’ll know what they are later on. I predict NO problems with that whatsoever! I then used a bunch of thin Ultra ATA hard drive cable to wire all the buttons to the board. (Square, X, shoulder and what not) In the lower-right-hand corner of the above photo you can also see the PS2 power on/off switch. Doing this doesn’t allow the buttons themselves to have analog function anymore, just on/off… What? You didn’t know they were analog? They are! No, really! VERY useful you know! This next photo shows EVERYTHING installed in the front of the PS2p case, complete with labels to help! All this junk barely fit in the main 1″ portion of the case… but “barely” is better than “didn’t” so I was happy! 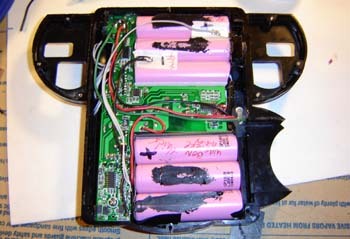 And here’s the rear half of the case, the part with the battery. 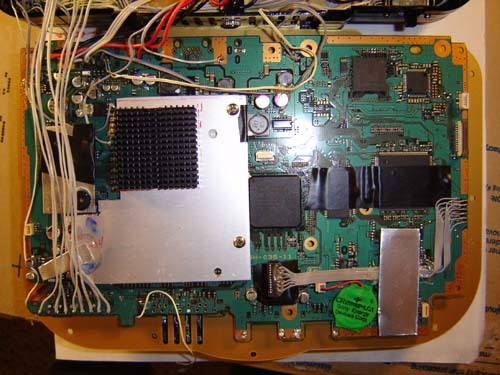 The PS2 board just kind of sits there unsecured, which is OK because once the unit is assembled there’s NOWHERE it can go. Not a heck of a lot of cable actually connects to the board. You can see the system battery and an amazing tin-snipped aluminum heatsink in the lower right-hand corner. Well, all that wiring sure was fun! (Almost as much fun as a root canal during a 12 hour flight in coach on a plane that ran out of beer) Time to move onto the final assembly! Once all the guts are wired the halves of the case get folded together. 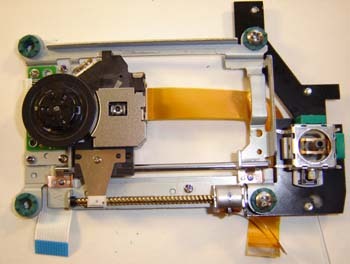 This shows the 3 main parts – the back, front and screen. 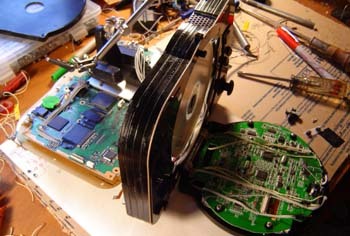 Then the screws on the DVD drive are attached to the CPU’s heat sink. 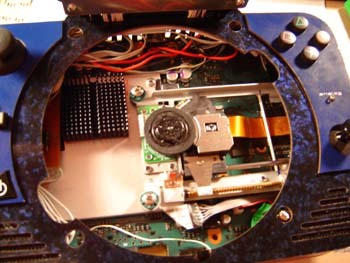 Near the bottom you can see the DVD spinner motor’s ribbon cable connected to the extended port. Here’s the back of the unit. I didn’t label the shoulder buttons because it should be pretty obvious what they are. 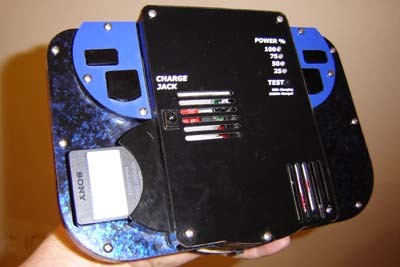 (That’d be just more decals for me to have to draw which takes away valuable time from building this thing and drinking MGD) The charge jack, test LED’s and memory card can all be seen, along with the blue/black marble texture of the unit. 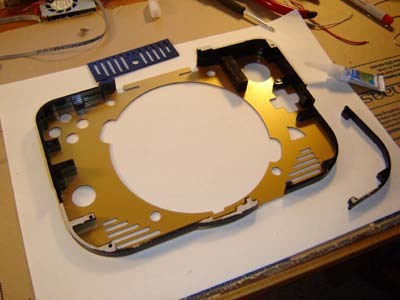 So that’s it – the story of how I build my PS2 Portable! Hopefully it’s been somewhat informative and maybe even a little enlightening. Now I must get back to working on some other belabored projects and take a break from portables for a little bit… but don’t worry – I’ll be back! I really wish I could make something like that. I do have alot of ideas to do different things but I just don’t have the knowledge for it. I would love to give ideas and let you take over.